Claiming Faucets, a fast tutorial on earning free cryptocurrency. If you dabbled in cryptocurrency you surely heard about faucets. If you haven't, faucets are sites on which you get bitcoins or altcoins by clicking a captcha. Giving away free cryptocurrency does not sound very profitable for the site owner, so the site owner displays ads to get some of the investment back, the income from the ads are shared with you through the clicking of the captcha button. 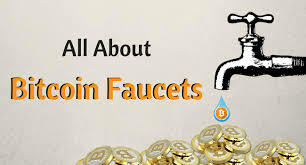 They used to make faucets back in the beginning because they wanted to promote a coin (Raiblocks, Bananocoin, Beancash), but the surge of faucets that the owner wants to make profitable are upcoming. This highly frustrates most people who tried faucets already, and dont want to continue because they can be very low earning. This usually happens because they sign up with every faucet there is on the internet, and try to claim as much faucets as possible. This usually turns into a lot of work, but does not reward at all. With this tutorial you wont make that mistake, and you keep time free to do other stuff in your life. Clicking the whole day away on bad faucets is a waste of time. If you do have more free time we offer a lot of faucets that are worth your time on the site. All you need at first is a wallet for your favorite coin. I recommend that you use a paper wallet, but if that is unavailable, or you want to keep your coins close to you, you can use a mobile wallet like Coinomi. Simply download the wallet in the Appstore or Playstore, and add the coins you want. I recommend adding BTC because most faucets use BTC, and you can always exchange it later to the coin you want, same goes for Litecoin, Dogecoin, and Bitcoin Cash. Next up is the most important part, the claiming of faucets. I wrote earlier about people who get frustrated with faucets. Faucets usually have timers. Timers can be 1 minute, 5 minutes, a hour or even longer. The 1 minute, 5 minute faucets are a waste of time. What happens is that you start spending all your time on the 5 minute faucet, waiting for the timer to run out. The earnings might look good because you can claim every few minutes, but you get burned out from the mindless work after a few days. You also can not claim while you are asleep, at work or at school. If a faucet offers 0.05 dogecoin every 5 minutes, and another offers 0.3 every hour, it is smarter to do the 1 hour faucet, and claim a few other 1 hour faucets. The five minute one wastes your time so you can not claim a bunch of 1 hour faucets with way higher earnings. The other reason why people get burned out is because they try every faucet they see, you should stick to a few high paying ones and reach minimum withdrawal before you want to use another faucet. Also try to stick to the microwallet services. This site can help you with both. A microwallet service is a service that makes it easier for faucet owners to pay you. Instead of paying you directly to your wallet (and incurring fees, thus making your withdrawal amounts lower) they deposit BTC to the micro wallet service, and the service will pay you after you reached a certain amount of coins on the service. This also ensures that the faucet owner always pays you, since the micro wallet services carry the cryptocurrency. There are a few important microwallet services that you should sign up with for the next step. Click the names and sign up for both of them. Dont get distracted by all the links on faucethub, most are not important. These two are the biggest microwallet services and will probably be the ones you will use the most. Now you can get to earning your first free cryptocurrency. This requires a bit of dedication. Depending on how much time you have on your hands, this can take from 3 days up to a week to see your first coins appear in your wallet. Sign up with the Coinpot faucets and follow the video tutorial. The video does not give you all the faucets, read the article to see all the faucets that they offer. Minimum withdrawal on Coinpot is very low, and there are no fees when withdrawing to your personal address. For Faucethub most people use the ones posted below. Dont forget to link your wallets in the faucethub dashboard. When you click claim your claims will be send to your faucethub account! You can click most of these sites easily in a hour, and will get you started with some basic earnings. If you need more faucets, just click around on tokenclaimer and look for ways to earn cryptocurrency. We also have a lot of passive methods listed on the site so you can invest your faucetclaims for interest. More interested in passive earnings? Try mining on Faucethub. It pays directly to Faucethub! Coinomi Review, Best Mobile Bitcoin Wallet? Bitpanda.com Review, Is It A Scam? Earn Bitcoin With Faucethub.io, Review. Bearprofit.com Review, Scam or Legit? Honeyminer.com review, Scam or Legit? bits-pays.com review, is it legit?